My plane arrived in Denver, local time around 6:30pm. Dylan promptly picked me up and we were headed on our way to grab food and then head straight to the trailhead. From Denver it's about a 4-5 hour drive to the trailhead of Capitol Peak depending on traffic and stops. This put us at the trailhead around 12 am. At first we had tried to drive up to the normal hiker start trailhead, however, with some large digits in the road up there we were forced to retreat and stay in the horse trailer parking lot. This ended up adding roughly 4 miles and 1000 extra feet of elevation gain to our already long day. One of the good things though about the horse parking lot was a large flatbed trailer that looked insanely comfortable at that time of night. We threw out our sleeping bags to the sounds of cows mooing and went to sleep. Cowboy camping on the flatbed. It was cool when we started, perfect hiking weather really. It took us only 30 minutes to make it up to the actual trailhead. As we got on trail we were following the beams of our headlamps through the woods over creeks and through dark meadows. The stars glistened overhead and it was spectacular. One of the things that caught our attention was the smell. The smell of evergreens was smacking us in our face and it was amazing. As we continued hiking upwards we continued to see headlamps in the vast darkness where we would be headed. It seemed as if they were way higher than it was possible to be, because, as it turns out, light can travel a long way. We made short work of the relatively smooth first 6 miles to Capitol Lake. We passed a couple parties then stopped for a drink and a bite to eat right near the lake. Up next was a big climb to the pass, of which we would be able to catch a great view of the valley we had just climbed up and the talus fields we were about to cross. Our goal was to arrive at the pass at sunrise. We made it in the nick of time, for as we were up there getting the camera out the warmth of the morning sun's rays hit us and filled us with positive energy. We could see Capitol Peak in front of us and the short but treacherous ridge that we needed to climb to get up to the peak. However, first was a few hundred feet of boulder fields we needed to cross, to gain the ridge and reach the summit of K2, a shoulder peak of Capitol. 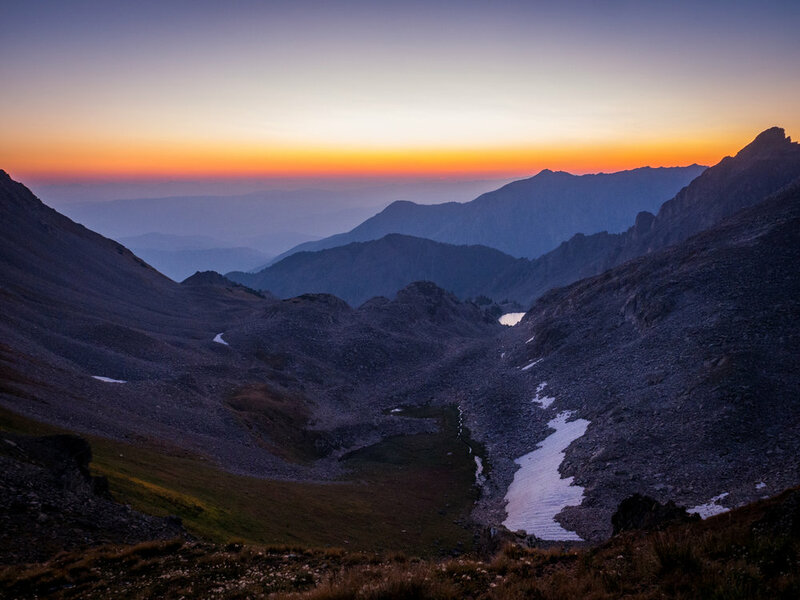 The alpenglow illuminated our path and transformed the mountains into the purple mountains majesty Katharine Lee Bates wrote about when she penned the poem "America the Beautiful." In crossing these fields it was slow going,. I'm always afraid the boulders are going to move and crush my ankle and I'll have to cut my foot off 127 hours style. Therefore, I take my time hoping from boulder to boulder and carefully evaluate each rock before setting my weight on it. The boulder and snowfields we had to cross to gain the ridge to K2. Upon reaching the summit of K2 we took a break for a drink and water. It was here we caught the first glimpse of the southern valley of Capitol Peak and the expansive views of jagged peaks in the Maroon-Snowmass wilderness. It truly was breath taking.. I think we were somewhere around 12-13000 feet at this point. We decided to go for the knifes edge and not really stop too long to look at it. It was around here that 5 climbers had perished in the past weeks and months. It was definitely in the back of both of our minds as we were making the calculated movements across the edge. 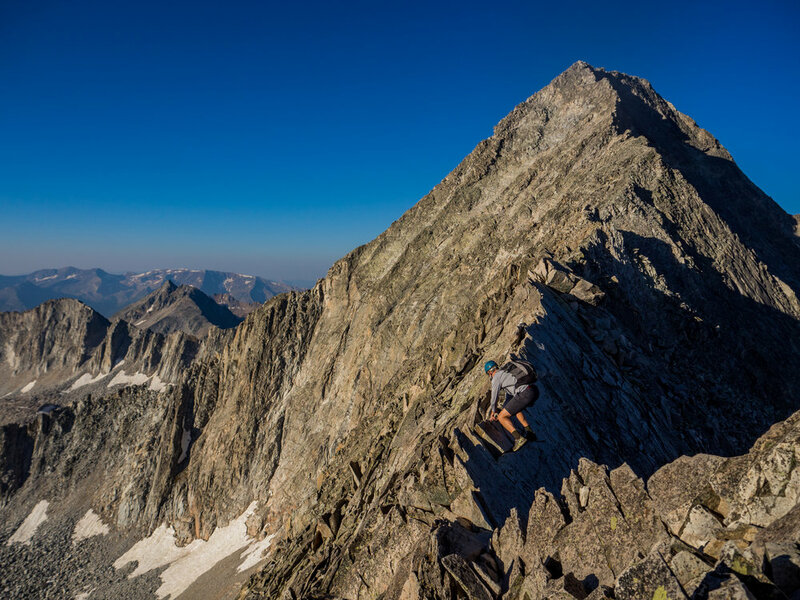 Dylan navigating Capitol Peak's infamous Knife Edge. As it turns out though, we agreed, the knifes edge wasn't entirely the worst part. The scramble up to the top of Capitol Peak presented it's own challenges because of the amount of choss leading up to the summit. Once and awhile a rock would come loose and fall hundreds of feet to the valley floor, smashing violently into little pieces. We made certain to test the rocks before we put any of our weight on them to trust they wouldn't fly off when we put our weight on them. Feeling a little hazy, but happy on top of my first 14er! About two hours after leaving the peak of K2 we arrived on the summit of Capitol Peak. 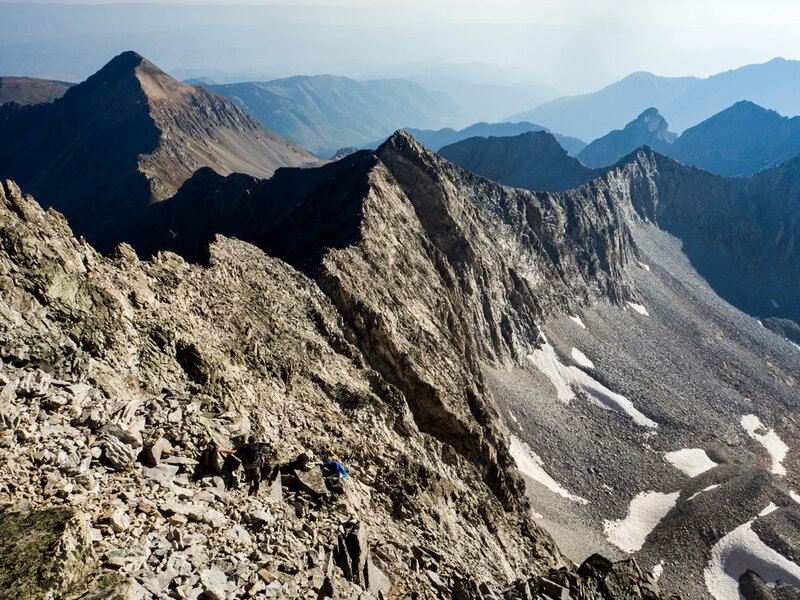 Capitol Peak has expansive views of the jagged and rugged mountains that surround it. Coming from a measly elevation of 900 feet less than 24 hours before I was holding my own at 14000 feet. I had a pounding headache and was definitely hazy and sluggish, but for the most part felt good. We paused for drinks, snacks and pictures on the summit before making the scramble back down to cross the knifes edge for the second time. Making the scramble back down to the knife's edge. K2 is the peak on the ridge. The pass we climbed up and over is to the left. Round trip back to K2 took us about 4 hours. Then heading back down the boulder fields took what seemed like forever. I ended up sliding on a snowfield and lost both of my poles. One of them went into a small crack down under a boulder. Since I had just bought these poles I wasn't going to leave them. I managed to find an entrance just big enough for my body to fit into and wiggled my way down to grab the pole. I was nervous of crossing the rest of the snowfields after that. I did not want a repeat experience. Upon reaching the pass, for the descent back into the valley where we had come up, I sat. It felt like the intense pounding in my head had gotten even worse. I took some Advil from Dylan and he gave me a pep talk. We decided to try and make it down to the car in 2.5 hours. Exactly one our less than the amount of time it took us to climb up to where we were. I like hiking with Dylan because we can both push through intensely difficult times. We had 6 miles to go from the lake and decided to run most of it. Out of the 6 miles we probably ran 4.5 miles of it. After getting below about 10,000 feet, I was feeling like myself again and we were racing down the valley. Some people questioned what we were doing running. We responded there was pizza waiting for us. It wasn't the truth, but it felt like the truth and at that point food motivated me. Moving fast, but taking time to smell the flowers on the descent. We were back at the car around 3pm, yes, all the way back down to the horse's trailer parking lot. Overall, it was a total of about 21 miles and 6500+ feet of elevation gain. I'd recommend this hike to anyone with a climbing background. You really need to be able to deal with exposure. Dylan and I agree, we wouldn't try this in anything less than ideal conditions. If you get stuck on the peak in a lighting storm there is nowhere to hide and the slick rock is going to make that scramble deadly. If you're not feeling the whole 20+ miles in one day you can camp at Capitol Lake. It's a beautiful lake right at the base of the main climb of the route. View of Capitol Peak on the hike out. Stay tuned for the second hike, where we explored Deluge Lake in the Gore Range.